Title: 'Virginiae item et Floridae Americae Provinciarum Nova Descriptio'. This is an important map of the American Southeast from the Mercator Hondius atlas. 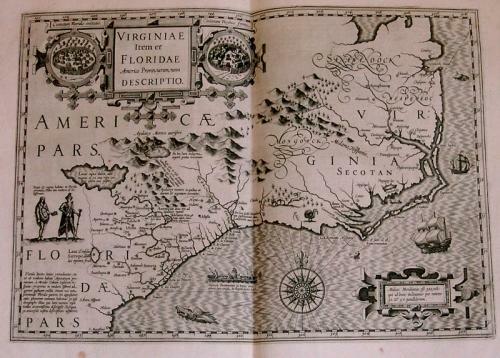 Jodocus Hondius' map shows the area from Virginia to Florida (and the earliest Spanish settlement at St. Augustine) and served as the model for a number of maps to follow such as the Blaeu and Jansson maps of the same region. Hondius based his map on the John White Virginia map and le Moyne's Florida map (Burden, p. 184). The map shows the Indian settlements from Florida and Virginia and decorative elements include native scenes, European ships and sea monsters. The map is in excellent condition with wide margins and no discernible faults. The shadow at the centrefold is caused by flash photography.